Fantastic Beasts: The Crimes of Grindelwald is the sequel to 2016’s Fantastic Beasts and Where to Find Them. 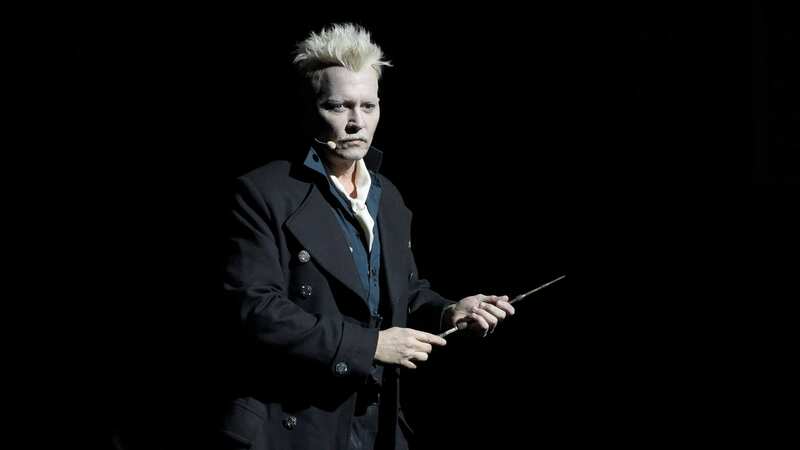 Grindelwald escapes custody and begins to raise an army to take over the Wizarding and Non-Wizarding worlds alike. Newt Scamander is charged with joining the fight against the evil wizard by a younger Albus Dumbledore. There’s a hell of a lot more to the film, but that’s kind of the problem. I’m a huge Harry Potter fan. I’ve loved these films ever since I was a child, I love the books, and I just adore this world. This is MY Star Wars. That’s why it pains me to say that Fantastic Beasts: The Crimes of Grindelwald is a disappointing mess of a film, with glimmers of greatness buried under its many plot threads. Confidently, I can say that the performances in Fantastic Beasts: The Crimes of Grindelwald are great. 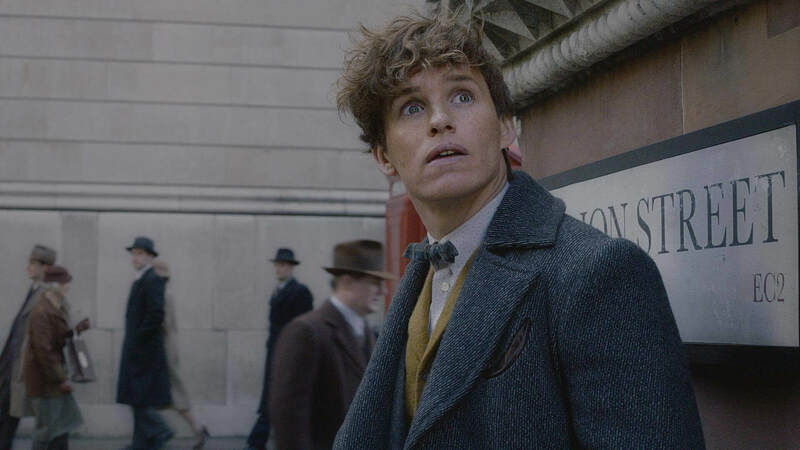 Eddie Redmayne continues to impress as Newt Scamander, playing his earnest charm perfectly, and he has a great dynamic with each member of the cast. He has a truly great scene with Callum Turner, his onscreen brother, towards the end. This moment is pivotal to Newt as a character, as well as being one of the better-acted scenes in the film. Katharine Waterson is back as Tina Goldstein, and while she’s not given a ton to do, Waterson always brings her A game. There’s a great scene between her and Redmayne at the Ministry of Magic that is adorable. Dan Fogler is back and still incredibly charming as Jacob Kowalski. He has great chemistry with Redmayne and Alison Sudol’s Queen (who also does good work in the film). Fogel is also incredibly funny and brings some of the best laughs to Fantastic Beasts: The Crimes of Grindelwald. Ezra Miller returns as Creedence, doing some fine work in the movie, but for reasons I’ll get into later, his inclusion is a bit frustrating. Zoe Kravitz is elegant yet tortured as Leta Lestrange. Kravitz does the best she can with what she’s given; she just happens that she kind of gets buried until the third act. Finally, let’s talk about the two actors that perhaps garnered the best buzz, positive or otherwise. 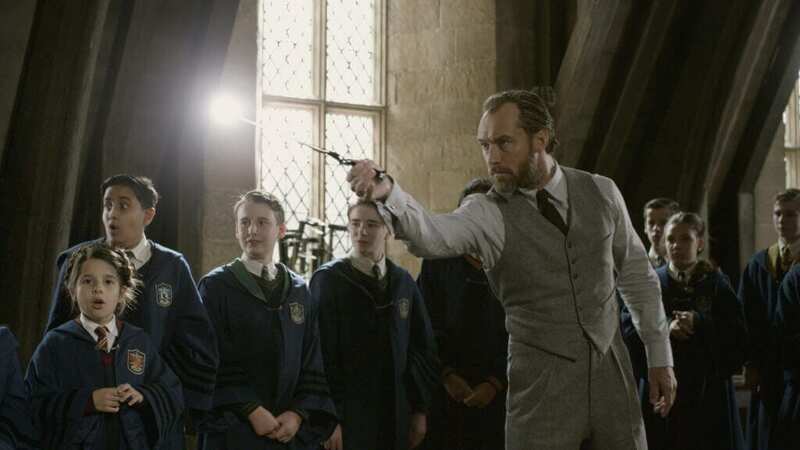 Jude Law as a younger Albus Dumbledore is PERFECT casting, and he does not disappoint. He’s not in the film as much as I wish he were, but in every moment of screen time he has, he’s endlessly charming, and he 100% feels like Dumbledore. He conveys Dumbledore’s wisdom too. I can’t wait to see how they use him moving forward. Johnny Depp as Grindelwald is underutilized (in his own film), but Depp makes the most of every moment of his screen time to the best of his ability and manages to turn in a standout performance. He’s creepy, off-kilter, and ruthless, yet charming. There’s something about his gaze that’s hypnotic. I believe that this man would do the things he does, and I can totally see people following him and his ideals. He’s charismatic as all hell. The plot of Fantastic Beasts: The Crimes of Grindelwald is a jumbled mess for the most part, and that‘s the film’s biggest issue. The screenplay, by series author J.K. Rowling, tries to accomplish so much that it ends up accomplishing pretty much none of it. It tries to handle plot threads involving Newt deciding what side he is on, caught between his brother, Dumbledore and his beasts. 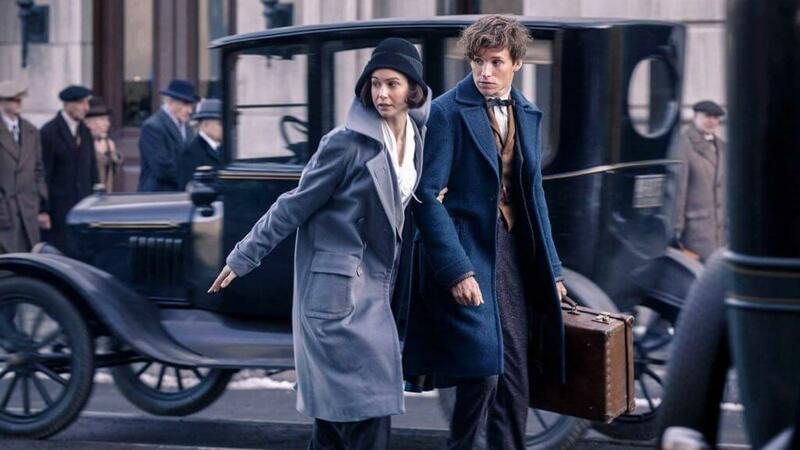 We have Jacob and Queenie’s drama, Tina and Newt’s will-they-won’t-they relationship, and Creedence’s lineage. Then you have everything involving Grindelwald, his history with Dumbledore, his plans for Creedence, and his motives for raising a following. The problem is that Fantastic Beasts: The Crimes of Grindelwald is so scatterbrained and jumpy that none of these plot points are fleshed out enough to justify being in the movie. You’d think that the plot line prominently involving Grindelwald, his rise to power and assembling his forces, would be the main focus of a film titled The Crimes of Grindelwald, but it’s not. There are times when Grindelwald feels obligatory, rather than an important part of the puzzle. Crimes is also stuffed with a lot of expository dialogue. Rowling often insists on telling us a story, like a novel more so than a film; as a result, certain characters serve no other purpose than to be a mouthpiece to force-feed us dumb audience members necessary information that could be conveyed to us visually. There is also a huge sequence that is narrated over by a character that infuriated me because the visuals on display tell the story enough that the narration is unnecessary. The fact that Fantastic Beasts: The Crimes of Grindelwald is so unfocused leads to a film that feels jarringly paced. For a good chunk of the movie, it’s slow and meandering. It’s odd because the film hits its narrative stride and flows the best in its third act, when Grindelwald is most prominently featured and his plan kicks in – a plan that I won’t reveal, but I will say that it’s genius. But then the film ends. Worse yet, the film builds its sense of “momentum” towards ONE reveal, and it lands with a resounding thump (and a lot of confusion for Potter Lore fanatics). When I looked back on the rest of the film afterward, surrounded by the extraneous plot threads and side stories, I realized this central focus would have been stronger with more screen time devoted to it. As it stands, it feels like Creedence is a plot device in his own story. This aspect is a double-edged sword, as it’s tragic for Creedence. The man just wants to know where he came from so he could have a sense of place and identity, but he’s destined to be a pawn in Grindelwald’s game. On the other hand, it feels like a waste of what could be a strong emotional payoff for the character. Newt has the next most important arc in the film, pushing his character to a certain point that I will not spoil and leaving him in an interesting place for the next movie. How he gets to the end of this arc, however, feels half-assed in some ways. His trajectory, and the backstory given to him and his relationship with two key characters, Leta and Theseus Scamander, really should feel smoother than it does. They give backstory to Newt and Leta’s dynamic, but Newt’s relationship with Theseus is underplayed, and that’s incredibly disappointing. It makes Newt’s choice in the end feel less weighted than it does. It could have been far more powerful than it wound up being. From a technical point of view, Fantastic Beasts: The Crimes of Grindelwald looks fantastic. The cinematography by Phillipe Rousselot is gorgeous, as usual. He brings the visual grandeur you’d expect from the franchise. The visual effects are dazzling. The creatures, in particular, look spectacular, richly detailed, and alive. It’s entertaining enough to watch just from a visual perspective. I think the effects in the finale are especially strong. I can’t spoil what they are used for, but they’re fantastic. The editing isn’t particularly good, though. Some scenes feel chopped, and as others have said, transitions are not particularly well-executed in this film. It’s also a very slow movie, and I don’t mean that it’s a slow burn. This film plods along at a slow pace until the finale. One of the shining aspects of the film is James Newton Howard’s incredible musical score. This man understands the music of these movies, and he knows how to magnify every moment. Some moments only work well as they do for me because of his score. The music during the opening chase is absolutely pulse-pounding, and listening to it while writing this review has been crazy enjoyable, so its great even when divorced from the material. He doesn’t just handle action scenes well, because the more emotional moments are also excellent. It’s a terrific score, and might be the best aspect of the entire film. The sound design is great as well; the blasts from wands, the shriek of the beasts – it’s all really well handled. The mix is also good; I never had issues hearing dialogue beyond my own theater’s speakers malfunctioning. Does this film still keep the magic of this franchise alive? There are definitely glimmers in certain moments, certain scenes. But overall, it just doesn’t feel the same. Maybe that’s only this film. I’d hesitate to say that the magic is dead, but WB/Rowling need to be very careful with the next movie. They have to take our breaths away with this world, because if they snuff the magic out, I don’t know if they’ll be able to reignite it. Overall, I’m really disappointed in Fantastic Beasts: The Crimes of Grindelwald. This was one of my most anticipated films of the year, and all of that excitement collapsed in the face of the overabundance of thin plot threads. The performances are strong, the film looks great, and the musical score is stellar, but that’s not enough to enchant me. Hopefully, WB learns from this one, and Fantastic Beasts 3 will be a better movie. What did you think of Fantastic Beasts: The Crimes of Grindelwald? Let me know in the comments below! Stay nerdy everyone! An overabundance of weak plot threads crush any sense of magic, leaving Fantastic Beasts: The Crimes of Grindelwald feeling anything but fantastic.